Xilinx® Alveo™ U280 Engineering Sample (ES) Data Center accelerator cards are designed to meet the constantly changing needs of the modern Data Center. 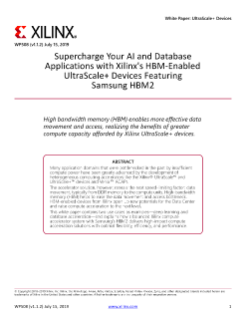 Built on the Xilinx 16nm UltraScale™ architecture, Alveo U280 ES offers 8GB of HBM2 410 GB/s bandwidth to provide high-performance, adaptable acceleration for memory-bound, compute intensive applications including database, analytics, and machine learning inference. The U280 ES acceleration card includes PCI Express 4.0 support to leverage the latest server interconnect infrastructure for high-bandwidth host processors. 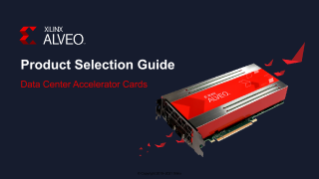 Alveo accelerator cards are adaptable to changing acceleration requirements and algorithm standards, capable of accelerating any workload without changing hardware, and reduce overall cost of ownership. The Alveo U280 ES1 Data Center Accelerator cards can be utilized for application development and prototyping. The U280 ES1 cards include a USB cable and right angle auxiliary power cable for developers. 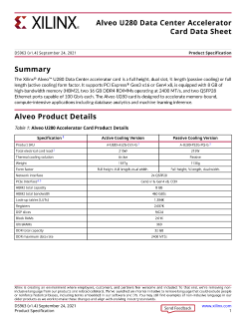 For production Alveo U280 information, see the Alveo Product Brief. The shell files for the U280 board are still in Beta. Please log into the U280 Secure Site to access. You will need to register, if you are accessing the site for the first time.